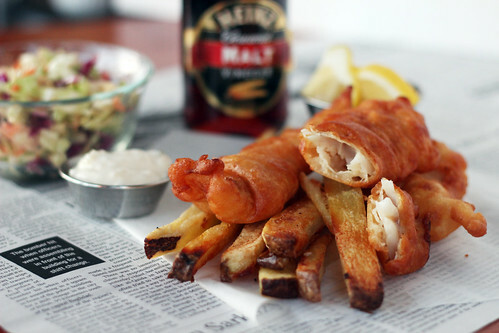 There are few foods that bring me right back to St. Patrick’s day and Irish pubs quite like Fish and Chips. The crispy and golden fried fish dipped in delicious tartar sauce. The fries soaked with malt vinegar. Mmm…. A little piece of Irish heaven. I couldn’t let this year pass with satisfying my craving for this delicious meal. Of course the only way to make it even better is to make it homemade! I have to admit that deep frying foods at home has always made me really nervous. The huge pot of basically boiling oil was super intimidating to me. But it was time to conquer my fear. Once I got all of my ingredients prepped, I was surprised at how simple it was. To make sure I was able to fully devote my attention to frying the fish, I decided to oven bake the fries. It was nice because I was able to have both things going at once and didn’t have to worry about keeping the fries warm, though I’m sure deep fried fries would be amazing. If you would like to fry your fries, check out Laura’s blog, Tide and Thyme, for those instructions. Preheat oven to 475 degrees Fahrenheit and prepare a baking sheet by coating with 4 tablespoons of vegetable oil and sprinkling with salt and pepper. Peel the sides of the potatoes, leaving some skin on the ends, then cut into 1/2 inch slices lengthwise. Carefully stack the potato slices and cut into 1/4 inch strips. Place cut fries in a large bowl and cover with warm water and a teaspoon of kosher salt for 15 minutes. Drain water and layout fries on a clean dish towel to dry. While the fries are drying, wipe out the bowl they soaked in. Return the fries to the now dry bowl and toss with 1 tablespoon of oil. Spread evenly on prepared baking sheet and cover tightly with foil. Bake for 5 minutes. Remove foil and bake for another 15-20 minutes (rotating pans once or twice), or until bottoms start to turn golden brown. Using tongs or a spatula, flip each of the fries. Bake for another 10-15 minutes. While the potatoes are cooking, mix 1 cup of flour with 1 cup of beer and a teaspoon of salt in a medium bowl. Put remaining 1/4 cup of flour in a large ziploc bag. Fill a dutch oven a little less than halfway with vegetable oil. With burner on low-medium, bring oil to 375 degrees Fahrenheit. Once oil is hot and you’re ready to fry, place fish in Ziploc bag and shake to coat with flour. Take each fish piece and dip in the beer batter, then place in the hot oil. Fry for about 3-4 minutes then use tongs to flip and fry for another 3-4 minutes, or until deep golden brown. Repeat this in as many batches as necessary (I was able to do about 4 pieces per batch without feeling like I was overcrowding the pot). 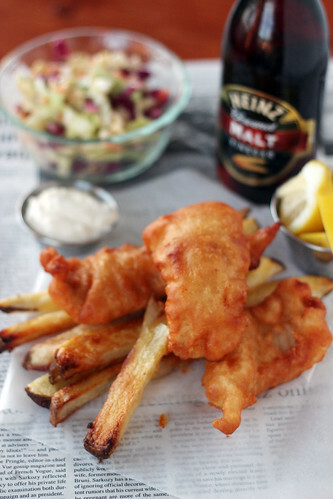 Serve fish and chips hot with fresh cut lemon wedges, tartar sauce, and malt vinegar. Also goes great with coleslaw! Have lots of clean kitchen towels and paper towels ready to dry potatoes, clean up drips, and clean off fingers. Have tongs and spatulas ready for fish and chip turning. A candy thermometer is a must to monitor the temperature of the oil, especially if you have a crappy stove top like I do. I cut my fish into a total of 9 pieces (they were each 3-4 inches long). Have a cooling rack lined with paper towels ready to go for when you take the fish out of the oil.